Gorgeous! 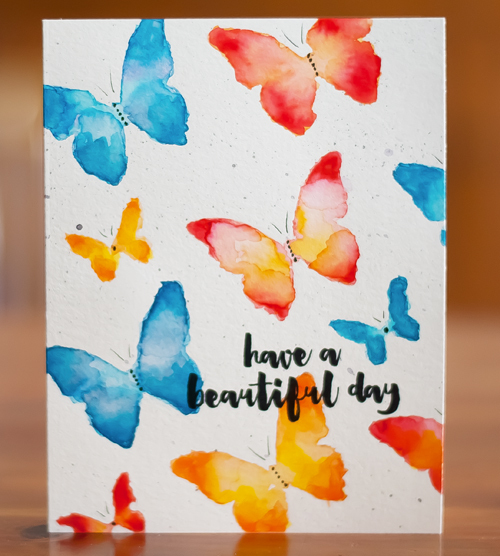 I love the red and orange middle butterfly because of the watercolor edges and blend! SO pretty! Now I want a cookie. Thanks for the directions you used! This is gorgeous and I need to case this! Beautiful Joan! I need to use my Tombow markers more! Beautiful card, amazing technique! Thank you for sharing! Joan you've managed to teach me one or fourteen things with this card! Gorgeous. Running the card through the Big Shot? Who knew?! SMH!! All these years and it never crossed my mind to run a card through the Big Shot to flatten!! Hummmm. Guess you CAN teach an old dog a new trick!! Love the butterflies. I am a firm believer there can never be too many butterflies!! Very pretty watercoloring! I like your explanation of how you achieved this look. Thanks! These are gorgeous butterflies; I love all the blends and little layers in each wing.